← The Central Tokyo Temple Resembling A Spaceship! This south-east Asian country is one with such a troubled past so it is with a hint of embarrassment that my gateway to all things Cambodian came from a movie based on a popular video game. Yes, it was indeed ‘Lara Croft: Tomb Raider‘ (2001) which sparked my interest in Cambodia rather than any of the more serious pieces made about the Khmer Rouge. When Cambodia first appears, Lara (Angelina Jolie) is parachuted down (in her Land Rover no less!) into Siem Reap on a mission to retrieve half of the triangular MacGuffin. Phnom Bakheng is where Lara begins her journey as she looks through her binoculars before driving off from outside Bayon temple in Angkor Thom. 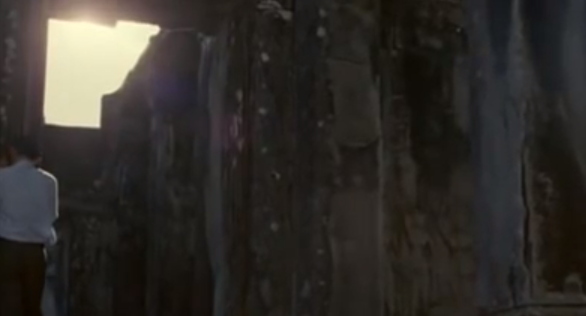 However, it’s Ta Prohm which is most famously associated with ‘Tomb Raider‘. This spectacular temple entwined with enormous trees is where Croft encounters the mysterious girl and is pointed in the right direction. World Heritage site Angkor Wat appears to be looming over a lake bursting with waterlilies and boating villagers. There are mixed reports on this one with some saying this elaborate floating village was constructed on the northern pond. Others refute that and say it was just a set with CGI used to add the worlds largest religious building into the background. Whilst there are a couple of pools at Angkor Wat, there is no activity on them whatsoever. 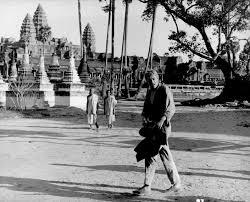 ‘Lord Jim‘ (1965) starring Peter O’Toole is one of very few films to be shot at Angkor Wat itself. 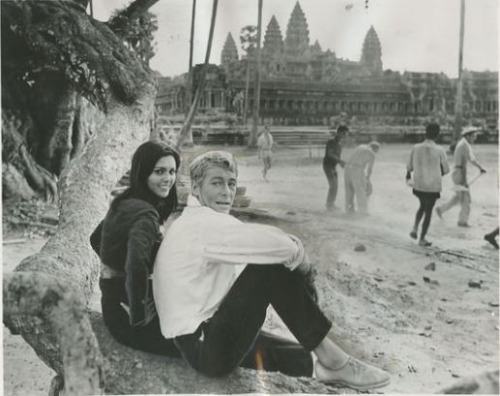 This second adaptation of the 1900 novel of the same name included three months filming in Cambodia which O’Toole described very negatively in a 1971 interview. 1966-style Cambodia finally appears 89 minutes into ‘In The Mood For Love’ (2000) and the final scene was filmed at Angkor Wat. Hong Kong actor Tony Leung (of ‘Infernal Affairs‘ and ‘Chungking Express‘ fame) confesses a secret into one of the ancient temple wall crevices. For ‘Transformers: Dark Of The Moon‘ (2011), one day of shooting took place for some very brief Cambodian scenes. In the film, orders are gives to launch many Pillars at photogenic locations like Ta Prohm and Bayon temple in Angkor Thom. 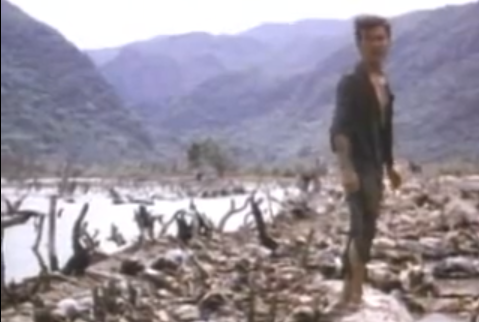 The definitive film about Cambodia though has to be ‘The Killing Fields‘ (1984) which tells the story of American journalist Sydney Schanberg and his Cambodian assistant Dith Pran. Schanberg escapes the fall of Phnom Penh in 1975 whilst Pran is left behind and presumed to be dead. However, he manages to survives the cruelty of a Pol Pot and Khmer Rouge-ravaged Cambodia regime in a splendid tale of defiance and resolve. Most of it was filmed over the border in Thailand though as back then, the country was nowhere near as open to the western world as it now is. The French Embassy featured throughout is the Colonial Town Hall on Narisarn Road in Phuket Town. As for the Phnom Penh Hotel seen on screen, that was the Railway Hotel in Hua Hin which is nearly 200km south of Bangkok. As ‘The Gate‘ (2014) starts in the seemingly peaceful Cambodian countryside of 1971, Mr Bizot is living in a village at Angkor with his Cambodian wife and daughter. Having been to a pagoda with two colleagues to study a Buddhist text, he is taken prisoner by a squad of Khmer Rouge soldiers on his return journey. He’ll always be Mike from ‘Neighbours‘ to me but actor Guy Pearce has gone on to great things since leaving the Australian soap and in ‘Two Brothers‘ (2004) he plays Aidan McRory; an unscrupulous but kind explorer, big-game hunter, and temple looter. Shot over a period of five months, around 30 tigers were used for the film, most of them coming from French zoos and the rest from Thailand. One of the problems about filming in Cambodia (apart from the humidity, native fauna and snakes) was the large number of landmines still in existence. 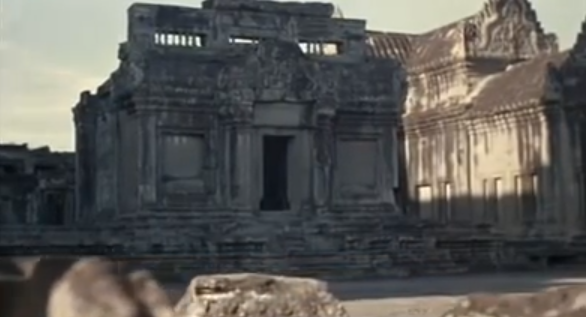 Filming locations included Thailand, France and Cambodia itself represented by places near Siem Reap. Kampot in the south-west of Cambodia has featured in a couple of films and in Matt Dillon’s thriller ‘City Of Ghosts‘ (2002), the Old Palace Hotel at Bokor Hill appears at the end of the movie as things are unravelled. 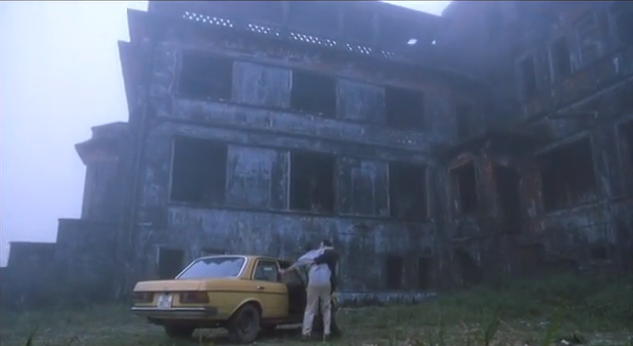 The Bokor Hill Station also played a starring role in Korean horror film ‘R-Point‘ (2004). Although filmed in Cambodia this movie was actually set in 1972 Vietnam during the Vietnam War so isn’t really fit for inclusion here but I thought I’d mention it anyway! A couple of European films next by way of French drama film ‘Holy Lola‘ (2004) and German love story ‘Same Same But Different‘ (2009). The former involves an infertile French couple who travel to Cambodia to adopt an orphan before Christmas but it seems like there are many other French couples with the same idea and naturally things get a bit heated as they have to deal with corruption, rain, mosquitoes, administration and uncertainty. The latter is based on the true story of a backpacker meeting and falling in love with a young local girl in Phnom Penh who turns out to be HIV positive. ‘Shadow People‘ (2013) is set in Cambodia in 1979 with a child lurking at the periphery of a group of old men sat around a fire who are telling stories about a black shadow that has killed people in the neighbouring village. A young woman catches the child listening and tells him to go to sleep and that’s pretty much the end of the South-East Asian country on screen in this one. Shooting the epic war film ‘Apocalypse Now‘ (1979) was a very problematic one for director Francis Ford Coppola with a huge budget drying up, a heart-attack for main man Martin Sheen, an over-weight Marlon Brando arriving with was no script for him, filming going way over time, a hurricane destroying the set and then there was the editing of over 200 hours of footage which all hindered the production. Luzon in the Philippines filled in for the scenes which were of course mostly set in Vietnam during the two decade long war. However, the final third of the film is set in Cambodia where Captain Willard (Martin Sheen) finally arrives having been sent on a dangerous mission there to assassinate a renegade colonel who has set himself up as a god among a local tribe. 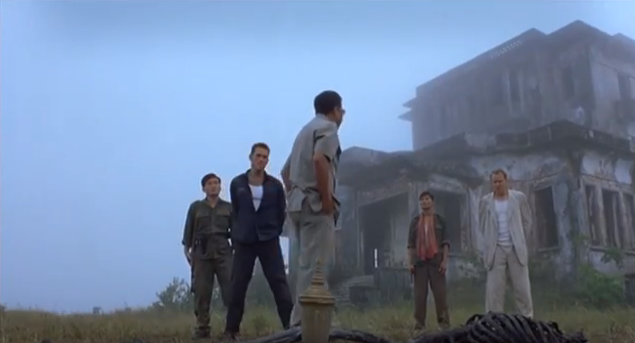 ‘The Adventurers‘ (1995) is a Hong Kong action movie starring Andy Lau (known to me for his role in ‘Infernal Affairs III‘) with Vietnam doubling up as Cambodia in the 1975 scenes which kick off the film. Conversely, Cambodia appears at the end of the ‘The Pirate Bay Away From Keyboard‘ (2013) when Swedish anti-copyright activists await the verdict of their appeal. 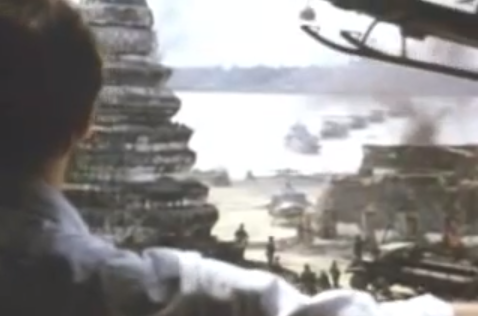 Going all the way back to the 1930’s and there were two films set in Cambodia back then. ‘India Speaks‘ (1933) and ‘Revolt Of The Zombies‘ (1936) were filmed in India and the USA respectively. I’ll admit that I haven’t seen either but it seems that the latter is about an international expedition sent into Cambodia to destroy an ancient formula that turns men into zombies. In the world of television, the BBC aired a short series of programmes under the title of ‘The Mekong River with Sue Perkins’ (2014) which featured the comedienne travelling up the river from start to finish passing through Vietnam, Cambodia, Laos and China with a few little detours along the way. Episode 2 (of 4) saw the keen environmentalist continue her travels through Cambodia taking in Phnom Penh and the remote highlands of Ratanakiri among other places. On his old Discovery Channel show ‘Anthony Bourdain No Reservations‘ (S07E02) the American TV chef visited Phnom Penh, Kampot and Siem Reap and sampled local seafood whilst meeting some politicians to discuss the country’s difficult Khmer Rouge past. In the world of reality TV, ‘Survivor: Cambodia – Second Chance‘ (2015) aired on NBC in the USA very recently with the 20 castaways filmed doing their stuff on Koh Rong in Sihanouksville province; Cambodia’s second largest island in the south-west of the country. This entry was posted in Asia Travel, Movie Locations and tagged Cambodia On Screen, City of Ghosts filming locations, films set at Angkor, films set in Cambodia, Lara Croft Tomb Raider movie locations, list of films set in Cambodia, movies set in Cambodia, tv shows set in Cambodia. Bookmark the permalink.